Your Industry News.com reports today that US regulators have received the first part of an application to build a laser-based uranium enrichment plant in North Carolina. The plant would represent a development of the Silex technology developed in Australia and licensed by GE–Hitachi. That firm founded a venture called Global Laser Enrichment (GLE), in which Canadian uranium producer Cameco subsequently took a 24% stake. GE-Hitachi announced today that the environmental portion of a combined construction and operating license (COL) application had been submitted to the Nuclear Regulatory Commission (NRC). The company said the NRC had approved the early submission on 13 January on grounds of greater efficiency. The licensing process is expected to take about 30 months, with the [sic] much of the time being devoted to the environmental report. The remainder of the COL is set for submission in June this year. GLE has been preparing a test enrichment loop based on the Silex laser technology since mid-2008, with the intention of demonstrating the commercial feasibility of the technology and advancing the design of the nece ssary equipment, buildings and processes. “Major components have been designed and are in the process of being manufactured and delivered for installation,” said GE-Hitachi. GLE said it intends to use its learning from the test loop to make a decision this year on whether to build a full-scale plant, but the early submission of part of the COL indicates a great confidence in the project. Should GLE go ahead with a full-scale laser enrichment plant, it would be sited alongside GE-Hitachi’s headquarters at Wilmington in the US state of North Carolina. The capacity of the plant would be between 3.5 million and 6 million separative work units (SWU). 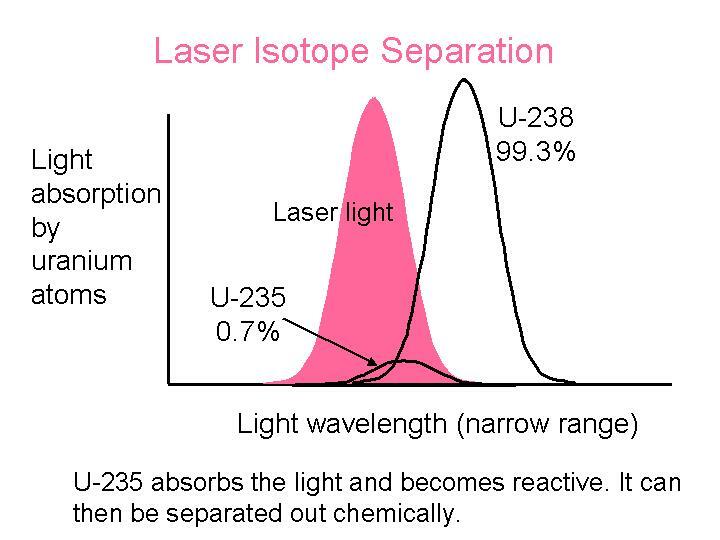 It would be one of a handful of new enrichment facilities in the USA, but the only one in the world to use laser excitation to separate uranium-235 from the marginally heavier uranium-238. Other new facilities use centrifuges, while older facilities use a diffusion process. “Nuclear power is going to be an important part of our energy mix,” Chu said. “The OECD warned yesterday of a “deep slowdown” in all major industrial economies and most of the emerging economies, including China. The last official forecasts from the International Monetary Fund had predicted China would continue to record strong growth, while the world economy was tipped to grow 2.2 per cent this year. However, estimates are being revised sharply lower in the wake of huge falls in industrial production in all major world economies. As soon as I hear an update on the test loop to be performed by Global Laser Enrichment (GLE), a subsidiary of GE Hitachi Nuclear Energy (GEH), for GLE’s next-generation laser enrichment technology (utilising Cameco‘s recently acquired yellowcake?) I’ll post it here. Yo, people, thought I’d do a little post on the soon-to-be-released movie “Australia.” I’ve included a trailer to watch. Although it’s very dramatic, the trailer doesn’t give quite enough information, in my opinion, about the plot, so I’ve included a link and a quote below. It comes to theaters in the States on November 26 (day before Thanksgiving) and stars Nicole Kidman and Hugh Jackman. He looks pretty awesome, buff as usual, and sporting a nice beard in lieu of the wildman hair of his Wolverine (X-men) days. [Author’s Note 19Nov: Hugh was just named People Magazine’s Sexiest Man Alive for 2008.] For photos and more on the movie, click here. This is a quote that I put into my signature on my email account. I picked it up some time back because I felt like the past two years (and in particular this past year) have been quite the journey down roads unknown, and at times I felt more than a little lost. But during that journey, I also discovered new things about myself; some things I liked, some I didn’t. At times, I had to reach deep inside to find courage and tenacity. I had to learn to let go of certain ideas, so that another could heal. I had to put on a brave face when all I wanted to do was cry. I learned to trust God for the sake of a family member that I could not bear to lose. And most recently, I had to put my heart aside, insulate it, and make certain decisions based upon conviction, rather than on emotions. So thick was my insulated shell that I had literally stopped allowing myself to feel. Ah, but sometimes the sneakiest little things penetrate our shields, cracking the ice, and warm feeling flows in a river of tears. This New Tourism Australia advertisement was the catalyst. I saw this ad on The Australian two days ago for the first time. On the surface, one might not quite “get” how such a rather benign commercial could have such a profound effect on me. Technically, it shouldn’t have. Suffice it to say that I see things differently than most. This ad is about a romantic couple. One individual is a high-powered executive whose work dominates her and interferes with her personal life. Her husband or partner seems to have had “enough” of that and wants a break from her. But, an Australian aboriginal child comes to the woman during her sleep and sprinkles red earth on her, whispering, “Sometimes we have to get lost to find ourselves. Sometimes we have to go Walkabout.” Corny, right? Americans who remember Crocodile Dundee might remember the expression “walkabout.” In general it refers to a rite-of-passage that aboriginals engage in wherein they wander the wilderness alone at a young age. I think in this case however, “walkabout” refers broadly to any sojourn away from a hectic life where one can re-connect with nature. The following scenes show this same couple swimming in a magnificent natural pool, clearly rediscovering their love for each other. The sense is that they are renewed and changed, for the better. The overall message is that Australia is a place of healing and peace; a place to let go of what isn’t important in our lives in favour of what is important. Come Walkabout, let your old self get lost and discover a new you. This touching, earthy advertisement made me cry. Having just returned to the States from a lengthy, yet not long enough, stay in Australia – I cried for things that could have been and never were, and how I wish I could have been the one swimming with her partner, rediscovering love. I cried for a great many things; my heart finally shedding its self-imposed ice in mourning for all the things I miss about Australia (which is indeed magical), all the things I wanted to be in Australia, and for my husband who is still there ~ alone. In relation to the commercial, on the surface I could say that it is the antithesis of the prior Tourism ad wherein they asked, “Where the Bloody Hell are You?” (Seems we’re lost – we don’t know where we are…) I don’t think that one can consciously choose to “get lost” so that one can find themselves. It seems to me it’s rather something that happens to us when we make choices and one day discover that those choices aren’t necessarily in our best interest, or don’t represent the real ‘us.’ Then you have that, ‘I was lost, but now I’m found – aha moment’ that makes life so intriguing. This is, in essence, gaining a new perspective on life. But, does this new perspective on life help us to make real changes so that we cease to make the same old mistakes? Do we grow inside when we face hardship and then struggle to overcome it? What if we bring those hardships down upon our own heads simply through our own bad choices or unhealthy patterns? Experiencing hardship can bring out the best – or the worst – in people. It can uncover the ‘real you,’ even help you discover things about yourself you never knew existed. What does running away from our problems teach us about ourselves? Leave your old problems behind? Start afresh? If only life were that simple. Just about any good parent will tell you that you can never run from your problems; instead, you drag them with you like invisible unwanted baggage. And they have a sneaky way of popping out of your closet when you least expect it. Yes, we surely need inspiration, and even hardship, to make excellent changes in our lives; to fix what might be broken, like being overwhelmed with work, being ruled by money and the commitment it requires to earn it, such as is depicted in this advertisement. Almost as if such dedication is too much of a good thing. Whatever our problems are, can we rise above those problems if we focus on our needs, rather than our wants? Safe housing, good schools, a stable job and home-life are what every person dreams of. These things are interdependent upon our individual state-of-mind. What is comfortable and acceptable to one person may be deplorable to the next. What is normal to one person may be an unattainable dream to another. So what is the solution? Run away to another country and lose oneself in nature? While a healthy break to commune with nature is certainly one very valid way to regain perspective and redefine personal goals (…and Australia is certainly a great place to do exactly that…) it is not the only answer. I think the key lies in communication with ones heart AND with your loved ones. Talk about what really matters to you. Is it a fine house in a great neighbourhood? Is it a fast-paced job on Wallstreet? Is it serving your community? Working with needy families? Or is it rock climbing in Colorado, or building a runway in the Antarctic? The key is to discover who you are inside and take a leap of faith; it’s about letting go of fear, so you can build your dreams your way. And when we find ourselves in that Aha Moment, the key will be in summoning the courage to say, “This decision was wrong for me and I want to make changes.” Doing so will help remove the stress from your life, help you to feel more in control, and ultimately lead to healthier relationships. Yeah, then when you’ve got the money, go swimming in Australia. It can’t be beat. In my two previous Nuclear Energy Blogposts, I briefly wrote about the current global nuclear revival activity and its connection to the somewhat new uranium enrichment modality called ‘Separation of Isotopes by Laser Excitation.’ In this post, I aim to expand upon these topics and emphasise Australia’s burgeoning importance in the world’s nuclear energy revival. Disclaimer: Before I begin that arduous task, let me point out that I am not in any way, shape, or form an expert on anything regarding science or the nuclear field. In fact, I’ve no educational background whatsoever in this regard. I’m just an amateur writer who happens to have a personal interest in Australia and its mining industry, and in current events. The majority of what I present here will be factual information pulled straight from news sources and government or corporate websites; the remainder is purely my own humble opinions. So with that being said, I have taken it upon myself to self-educate by doing a little research on the nuclear process, the market, and which players are involved in achieving the goal of becoming an energy self-sufficient nation. What I haven’t done is research the negatives. If anyone who reads this would like to comment in that regard, or on any other point, please do – I would love to hear your take. At present, there are 440 nuclear reactors operating world-wide, with another 30 in the construction phase. Approximately 40% of the world’s enrichment capacity is by means of gaseous diffusion; however, most gaseous diffusion plants are nearing the end of their design life, becoming obsolete. –USEC, Inc (NYSE:USU) http://www.usec.com supplies approximately 25% of enriched uranium for world markets and more than half of the U.S. market. It currently operates the only uranium enrichment facility in the United States, a gaseous diffusion plant located in Paducah, KY. However, USEC has begun construction on its future American Centrifuge Plant, a ‘second-generation’ uranium enrichment technology developed by the US DOE. USEC was created in the 1990s as a US government corporation but was privatised in July 1998 by the Clinton administration. USEC subsidiary, NAC International, specialises in the transportation and storage of used nuclear fuel. –URENCO (Europe) supplies another 25% of the enriched uranium for world markets. URENCO wants to build an enrichment plant in Australia due to the growing Asia-Pacific market for nuclear power fuel. –TENEX (Russia) is the fourth major supplier of enriched uranium, representing another 25% of the market. Notably, 10 percent of world enrichment capacity up to 2010 comes from Russia blending down nuclear warheads which contain uranium. Following proposals from the International Atomic Energy Agency (IAEA) and Russia, and in connection with the US-led Global Nuclear Energy Partnership (GNEP), there are moves to establish new international uranium enrichment centers. Although Australia has the world’s largest known reserves of uranium, at present Canada supplies the lion’s share of uranium, at approximately 24.9%. Australia presently supplies 19.1%. Other sources of uranium are: Kazakhstan (13.3%), Niger (8.7%), Russia (8.6%), Namibia (7.8%), Uzbekistan (5.7%), USA (4.3%), Ukraine (2%), China (1.9%) and South Africa (1.3%). More money is being spent on uranium exploration worldwide and uranium projects in some countries, notably Kazakhstan, are being fast-tracked. Production is expected to expand in Canada, Russia, and Africa. 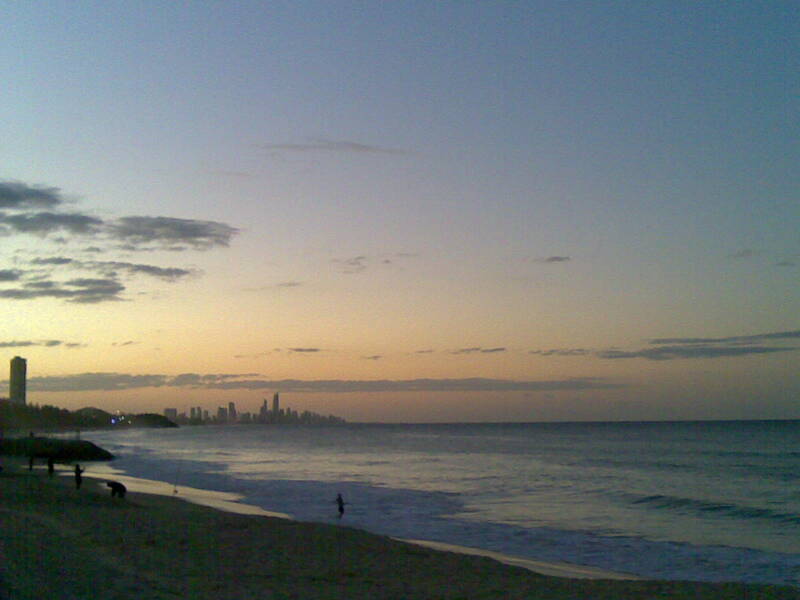 Australia’s output is expected to expand to about 11,000 tonnes in 2012-13 [Source: http://www.miningaustralia.com.au]. In fact, Western Australia has just this week approved the removal of a ban on uranium mining that will pave the way to exploit the vast uranium reserves there. Indigenous land-owners in the mining areas had disputed the ban in the past. This decision was no doubt tied to a joint-venture between Cameco Corporation, the world’s largest uranium producer, and GE Hitachi Nuclear Energy (GEH). Cameco purchased a 24% interest in Global Laser Enrichment (GLE, a subsidiary of GEH). Further, Cameco, in joint venture with Mitsubishi Development Pty Ltd, also recently purchased a 70% interest in the Kintyre uranium exploration project in Western Australia. Kintyre is an advanced exploration project located about 1,250 kilometres northeast of Perth [Source: http://www.miningtopnew.com]. Most of the 470 commercial nuclear power reactors operating or under construction in the world today require uranium ‘enriched’ in the U-235 isotope for their fuel. *Gaseous Enrichment technology, designed in the 1940’s, is very expensive and is, unfortunately, nearing the end of its design “shelf-life” making it obsolete. It currently represents 33% of the existing world market. *Centrifuge Enrichment technology is the second-generation enrichment technology and is considered “capital intensive.” It represents 54% of the existing world market. *Laser Excitation technology is still under development and is considered to be the best option for third-generation enrichment technology. Its’ enrichment efficiency rates are substantially higher than existing methods, and are actually “classified” by the US Dept. Of Defence. It promises much lower energy inputs and lower capital costs, along with other advantages [Source: http://www.silex.com.au]. The world’s first third-generation commercial laser enrichment plant. 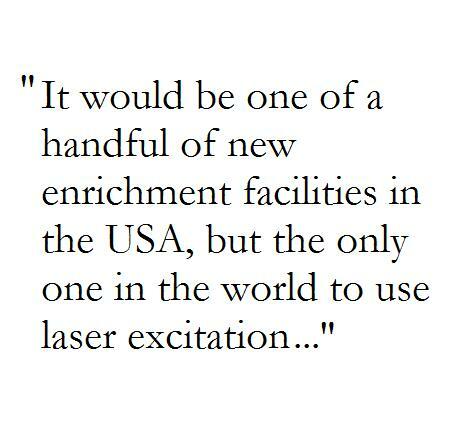 The only remaining laser process on the world stage is through SILEX Systems, Ltd. In 2006 GE Energy (now GE-Hitachi or GEH) entered a partnership to develop the SILEX process. It provided for GE-Hitachi to construct in the USA, an engineering-scale test loop [by end of 2008] then a pilot plant or lead cascade, which could be operating by 2010-12, and expanded to a full commercial plant. (Note: SILEX’s website, http://www.silex.com.au/) which was recently hacked, reports that installation of the facility infrastructure and services at the Wilmington plant are nearly completed.) GE referred to SILEX, which it has re-badged as Global Laser Enrichment (GLE), as “game-changing technology” with a “very high likelihood” of success. In mid 2008 Cameco bought into the GLE project, paying $124 million for 24% share, alongside GE (51%) and Hitachi (25%). GLE plans to complete the Test Loop Program in mid 2009, which if successful, would then open the way for the world’s first third-generation commercial laser enrichment plant to be constructed in the US.